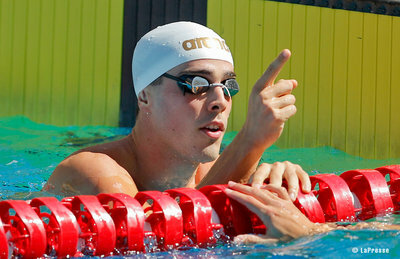 Tolentino, 9 April 2014 – Arena, global brand of water instinct, has signed a sponsorship deal with 25-year-old Brazilian swimmer Bruno Fratus. An out-and-out freestyle sprinter, Fratus is the current Pan Pacific 50 freestyle champion and record holder, and will be a serious podium contender at the 2016 Olympics in his home country. The agreement confirms arena’s standing as a brand reference for swimming’s top sprint events. Fratus has been a 50m freestyle finals regular since 2010, when he finished fourth at the Pan Pacific Championships in Irvine, USA. He followed this up at the 2011 World Championships in Shanghai with the best semi-final time – one that would have won the silver medal – but unfortunately couldn’t match the feat in the final, finishing fifth. Later in the year he picked up a silver medal in the same event at Guadalajara’s Pan American Games, and at the 2012 London Olympics had a near-miss as he finished fourth just 0,02s out of the podium placings. 2013 marked something of a sabattical for Fratus as he took time out to have surgery on a long-standing right shoulder injury. Having joined up in the interim with sprint coach Brett Hawke at Auburn University, he returned in fine fettle with an impressive 2014 season, starting out in March with the 50 free gold medal at the South American Games in Santiago, Chile. Summer took him to Australia’s Gold Coast for the Pan Pacific Championships, where he put in a career-best performance, beating an extremely strong field to take the gold medal in a new championship record time of 21.44. He finished off the year by swimming lifetime bests at December’s Brazilian Open in both 50 and 100 freestyle (21.41 and 48.57). Fratus has already started off 2015 strongly with a sub-22s gold at the Arena Pro Swim Series in Austin, followed up at April’s Brazilian nationals (the Maria Lenk trophy) in Rio with a 21.74 gold medal, beating our rival Cesar Cielo. These performances stand him in good stead with a forthcoming season that includes the Pan American Games in Toronto and the World Championships in Kazan. If all continues to go according to plan, he and countryman Cielo could well be racing for the Olympic title at their home Olympics in Rio come August 2016. The representatives of the shareholders of the Arena Group have confirmed Giuseppe Musciacchio and Luca Selvatici as co-CEOs. arena, the leading sport waterwear brand, is pleased to announce that the Board of Directors of the Fair Labor Association (FLA) has accredited its social compliance program at the latest meeting held on February 8, 2017 in Washington, D.C. Global water instinct brand arena has renewed its sponsorship agreement with British breaststroke sensation Adam Peaty with a four-year deal running through to the Tokyo Olympics in 2020. Global water instinct brand arena and the Hungarian Swimming Association (HSA) have renewed their long-standing relationship through a sponsorship agreement that will run through to the Tokyo Olympics in 2020. Global water instinct brand arena is pleased to announce the renewal of its partnership with the Royal Dutch Swimming Federation (KNZB) with the extension of its sponsorship agreement until the Tokyo Olympics in 2020.